Yesterday they started building the barn! First things first: auger the holes. The builders brought a little Bobcat with a large auger on it. Unlike our auger, this baby drilled holes lickety-split. Next step was to hoist the giant 20-foot pressure-treated 4x6's into the holes. Next hole. Each hole got nearly a cubic yard of concrete. As one of the builders put it, this barn is going nowhere. When all eight holes were filled, there was a little bit of concrete left, so we decided to pour a rough pad in front of the chicken coop, which turns into mud soup during wet weather. Don spread it out and leveled it. Whoo-hoo, no more mud soup! Naturally the chickens left little chicken footprints in the wet concrete. Fortunately they weren't heavy enough to sink in. That's all the builders could do until the concrete dried. As evening descended upon the building site, I marveled at what a thing of beauty a barn -- even a half-built one -- can be. That IS a beautiful sight!! How wonderful for you all to be able to spread out!! Hope your weather holds for you! I'm so glad that you're getting a new barn. I'm also a little jealous. Having someone else help with the building is such a blessing. Are the cattle having a "barn warming"? I empathize in your excitement. What a joyous work in progress. Having a big barn is a God send blessing on a farm. Congratulations on breaking the dirt and getting the poles erected! Good use of the extra concrete. If you still have trouble next winter where the new pad ends and the dirt begins, get a bag or two of quickcrete (readymix) and just spread it over the area and work it in. The ground will be much firmer even after a rain. We worked in two bags at our main 12-foot gate where the horses go out to pasture. Before, we were sinking to our ankles if that ground was wet ...the horses sank even furter. After I worked in the two bags of quickcrete, you don't sink more than an inch even if it's pouring down rain for several days. A thing of beauty indeed! You all must be excited to see this going up. I'm sure much planning went into it and you've probably been waiting awhile. So, congrats! The chicken footprints in concrete made me smile :) And, yes, your just-begun barn IS a beautiful thing! Hurray for your new concrete pad! I recall wintertime in our barn yard as a child. You could say it was ankle-deep mud, but it wasn't, not really. Really it was. . .
an incentive to keep the tetanus boosters up to date! Enjoy your new barn, and thank you for sharing. Your barn is going to be awesome! I'm relieved to hear that a government inspector checked the depth of the holes. Afterall, digging deep holes is what they do best. Yay! Love seeing a barn go up. :) Congrats! 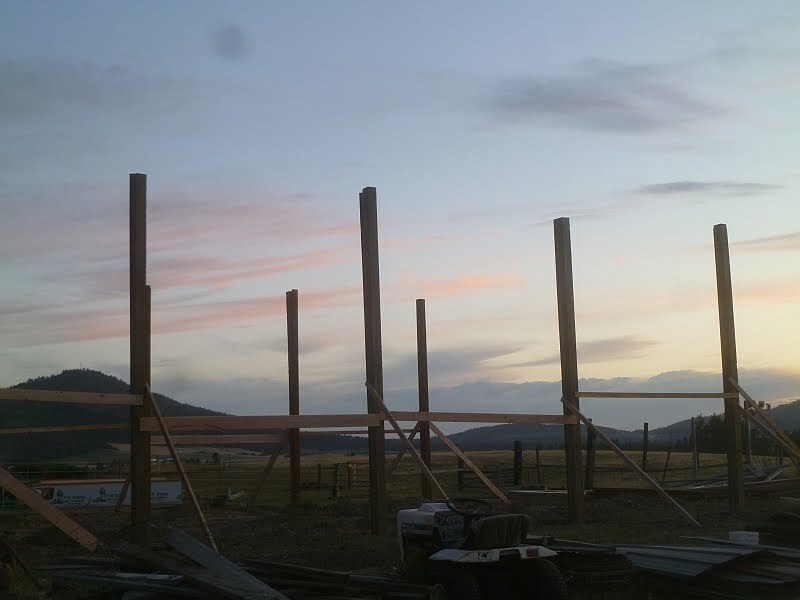 LOL - Is it strange that I am excited for a person who I have never met, that is building a barn I will never visit? Congratulations! I wonder if you did not use these heavy equipment; the construction may not be finished in a day.